I am saddened to learn that Tékumel and Empire of the Petal Throne creator Muhammad Abd-al-Rahman Barker has passed away as reported on the Comeback Inn by Chirine Ba Kal. 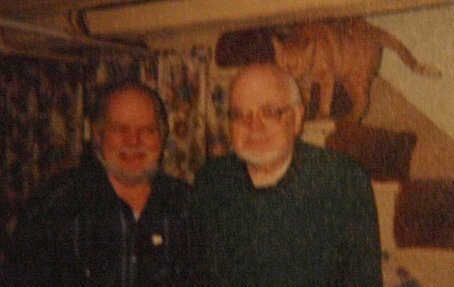 Called the "Forgotten Tolkien" by Gary Gygax, Professor Barker was a close friend to Dave Arneson and the two consulted eachother on various gaming projects. My thoughts go to his family and friends. Thanks for posting the photo. It reminded me that Arneson was allergic to cats. The fact that he tolerated the orange fellow on the stairs is a testament to how much he enjoyed Barker's campaign. Rest In Peace, Prof. Barker! I'm sorry to learn of his passing, and my condolences go out to his family and friends as well. I'm just starting to delve into his EPT body of work via Flamesong and the Different Worlds EPT reprint, and I am very impressed by the depth of the setting and its author's flair for the imaginative. I wish I had became a fan earlier... :-( Thankfully, Prof. Barker's Tékumel materials are archived by the Tékumel Foundation and the RPG in its various incarnations are officially available from Tita's House of Games for many more future fans to discover his genius. Thanks for posting this notification. And the photo! Two legends of the form that any true fan of creative and enthralling fantasy should know. Even more awesome that they gamed together regularly! Eldritch Ent Announces New Releases!